The following text is a guest blog post by David Overton (Country Manager UK and Ireland at Awingu). This article you can also read on David’s blog. Azure RemoteApp was the official Microsoft way to run your Windows Desktop Applications on Azure and access them from any device. The service was only available for a short time before Microsoft closed the solution stating that you would need a partner’s software to complete a solution. Awingu is one such partner, offering the ability to access your Windows applications via any HTML browser on any device without the need for plug-ins or downloads while ensuring a highly secure solution. Awingu offers so much more than this though as Awingu is a Workspace Aggregator. We offer Single Sign-On to all your cloud applications and access to all your files, whether on internal file shares or stored in cloud solutions. This is wrapped in security while enabling easy collaboration. We expect our partners to implement and manage the solution and if they want, our partners can deliver this as a multi-tenant service to their customers as Awingu offers this natively out the box. Today, you can through the Azure Marketplace, deploy the Awingu All in One solution and be deployed rapidly, waiting for you to add your applications and users/customers. Microsoft also announced that one way to move on from Azure RemoteApp was to lean on their previous relationship with Citrix. End of life for Azure RemoteApp was announced on August 12th 2016 and the end of support is August 31st 2017. Citrix has stated they will deliver their Essentials solution in the first half of 2017. It’s looking like it will be the later part of the half year, leaving customers and partners very little time to migrate their users to a new service if they wait for Citrix. With Awingu, you can start today. Listening to a Citrix webinar in January 2017, several challenges leaped out at me for both customers and partners. The Citrix cloud and their traditional on-premises products cost significantly more than an Awingu solution, both in licenses and running costs. Finally, it is still not available to implement yet! At Awingu, we only supply Awingu through partners. 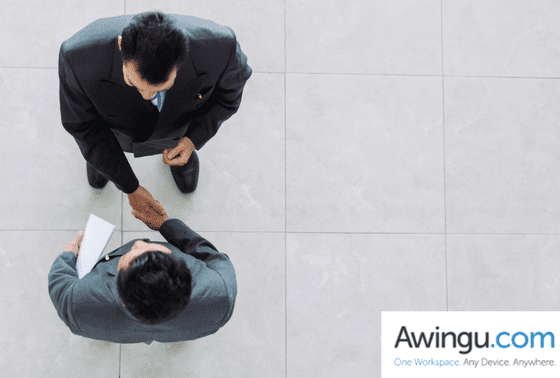 Whilst Awingu is simple to install and configure, we believe that customers want to manage their business and that our expert partners offer significant value in ensuring that the applications and files the customer needs available. With Citrix Essentials, the role of the partner is being reduced meaning that the opportunity to add value, and being rewarded for it, is also reduced. From the same webinar that launched their intention to deliver Citrix XenApp Essentials this year, Citrix seemed to suggest that partners are only required to provide a hosted, multi-tenant solution. You can see this in a snippet from one of the slides they presented. At Awingu we know that partners add much more value in delivering and integrating a solution to customers, especially when combined with the newer cloud applications that customers want to use. Let’s compare the differences between Citrix’s announced services and the solution available from Awingu today. The Awingu solution will run on any cloud or on-premises without any change of solution. You can see it below. That is the sum total of all the components and the use of SQL is optional. We do not install any technology on your Microsoft servers, but simply integrate them using the standard Microsoft protocols. Awingu can easily be integrated into your existing infrastructure without disrupting it at all. 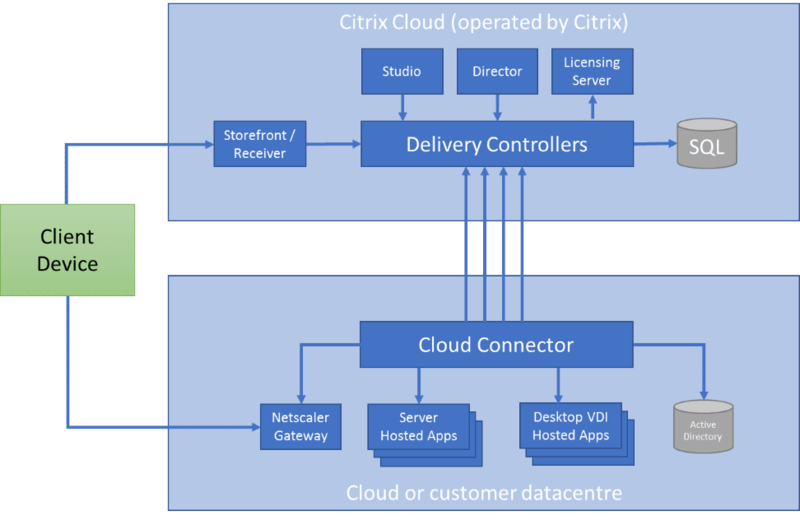 By comparison, the diagram below is the Citrix Cloud solution, the only way to get the Citrix XenApp Express solution as described by Citrix in their recent webinar to partners. Not only is it significantly more complex, but you must pay for Citrix to run their cloud services for you, whether you want all the products they put in the bundle or not. I’ve highlighted the places where you must install Citrix software by using blue boxes. You can see that you need to install Citrix components on all your existing infrastructure to start using Citrix. The Citrix Reference Architecture also states that “Also, the Active Directory server you are using must have Citrix Group Policy Management installed.” With Awingu, the impact on your other systems is simply networking access, without the need to install Awingu components elsewhere. Now, because you don’t have control of the Citrix Cloud, as that software is updated by Citrix, you have no choice but to match their schedule in the upgrades you perform on your own platforms running the applications. As I mentioned, Citrix is significantly costlier to purchase and maintain than Awingu. You can see more on the TCO comparison on the site Migrate2Awingu. When it comes to what is in the box, Awingu gives you all the functionality that you need, going beyond the traditional Citrix solutions. Not only does Awingu offer the remoting of applications, but also, using SSO we enable access from the same interface to your cloud applications and all your files, while offering a secure, auditable, collaborative solution. 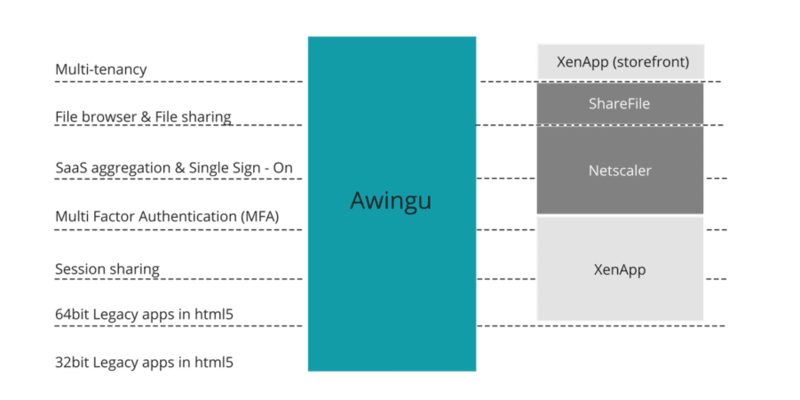 Using the information that is available from the Migrate2Awingu site, you can see how the Awingu product lines up against Citrix. With all those different components, upgrading can be very complex with Citrix. I remember reading about the process which is well documented on Terence Luk’s blog. Awingu upgrades are so very different. If you watch this 1-minute video, you can see the Awingu upgrade process. Upgrading through 4 versions took much less than an hour. There are several ways to move forward with Awingu. If you want to learn more about Awingu, please visit Awingu.com or request more information or sign up for a demo account please go to our Contact Us page. If you would like to become a partner, please share your information on the “Become a reseller” page. To learn more about the Awingu All-in-One solution available on Azure today, please look at Awingu on the Azure Marketplace. For more information about putting Awingu into your existing Citrix infrastructure to test and eventually migrate away from Citrix, have a look at this page.